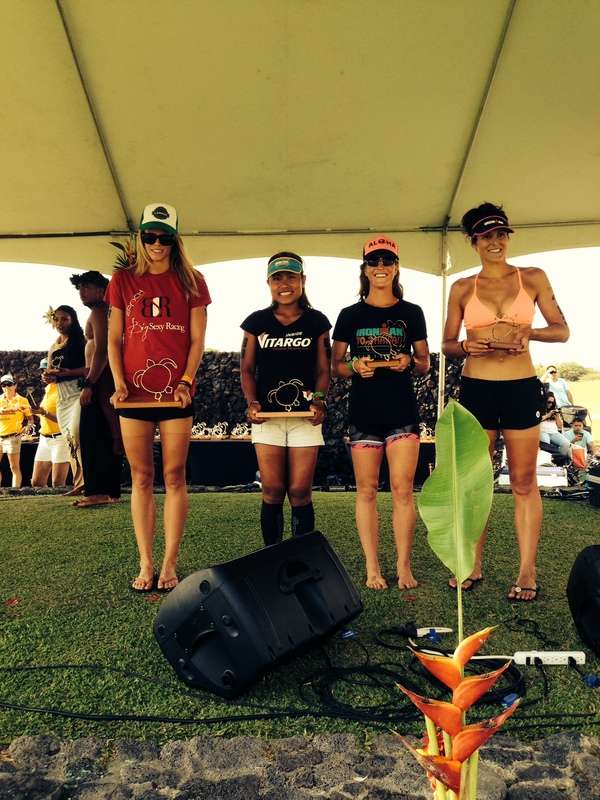 Ironman Hawaii 70.3 was a whirlwind race. 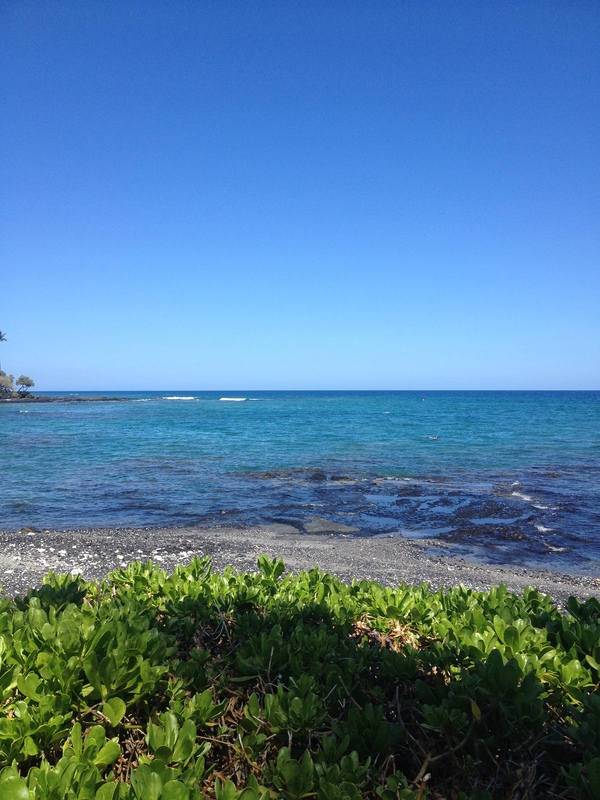 My husband and I flew out of San Francisco on Wednesday morning and arrived in Kona at 2 pm. By the time we got the rental car, got dinner and checked into our room I was ready to be out for the night and it was only 8 pm! Thursday morning I woke up at 4:30 am with the 3 hour time difference….. ugggg. 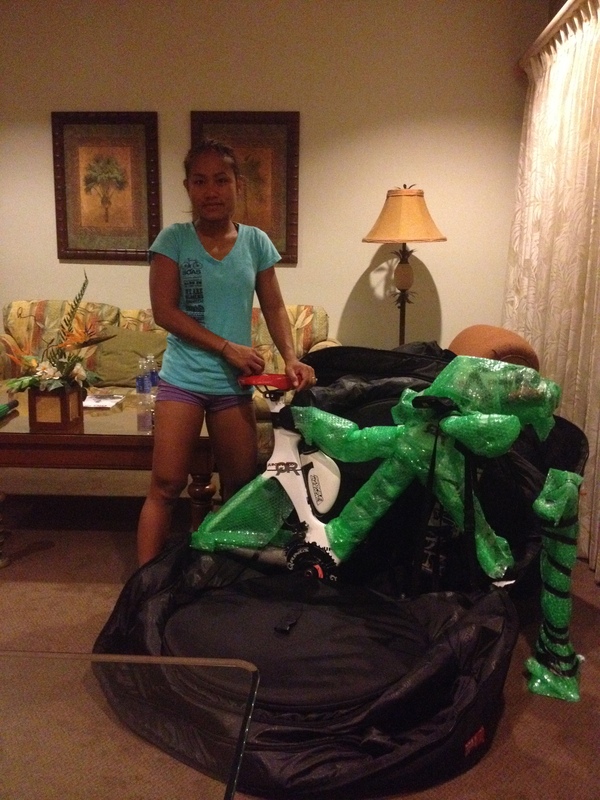 (This was very nice on race day though) Unpacking my bike was a quick chore along with breakfast then we left for the race venue. This was my first trip to Hawaii and I found it very beautiful and similar weather to the Philippines I was excited to race. 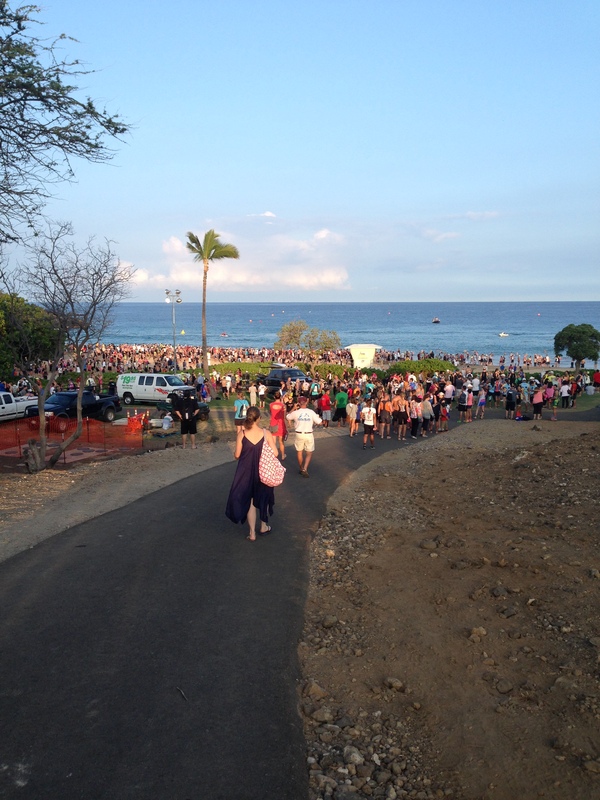 We took the back way and went down to Ironman world championship start and I have to say I kind of have the bug to try and qualify for that race. I have said all along that I am not interested in doing a full Ironman race…… BUT being where it all takes place seriously has me thinking about trying to qualify…..We headed over to registration the next morning then went out to drive the bike course which is a must for me before any race if possible. I found no surprises on the bike course and did a quick swim, bike and run to stay loose. Saturday morning came quickly and Robert and I took the first shuttle over to T1. This is the first Ironman race that I have ever done that reserved spaces were not used for either the T1 or T2 locations. It was interesting watching everyone (including me) trying to time their arrival for the bike drop the night before. It is the first race that I have seen where everyone was trying to be late to bike drop off as it actually gave your a better position. I have had ZERO practice with a big surf and standing on the shore watching the first couple swim waves battle to get out to the start I was seriously thinking about NOT doing the race. The waves were HUGE! Robert tried to explain how to dive under the waves, telling me they would just go over the top of me and it would be EASY. Uh Huh….. I don’t see him doing it though…:) I made my way over to my group of under 40 women and just told myself I had to figure it out as would be too embarrassing to NOT do the race. To my surprise when it was time for my swim wave I think God answered my prayers to have the waves stop for my entry as there weren’t any! Woooo Hoooo. The swim was actually not bad at all. I didn’t have near the time I wanted but I made it all the way around to the finish and again their were not any waves to battle coming in. Robert said there WERE some very big ones for other people but not for me so was very happy. I was 18th out of the water for my wave of under 40. This is becoming a pattern for me and I am really working on my swim to correct my form and strength. It is a very slow process and I am not very patient but have to deal with it. I had a good transition and got onto my bike focused on chasing down as many women as I could over the next 2:30 or so. This course is FAR from flat and with the wind that almost knocked me off the bike a few times and the heat very few had super fast bike times and this was true for me also. 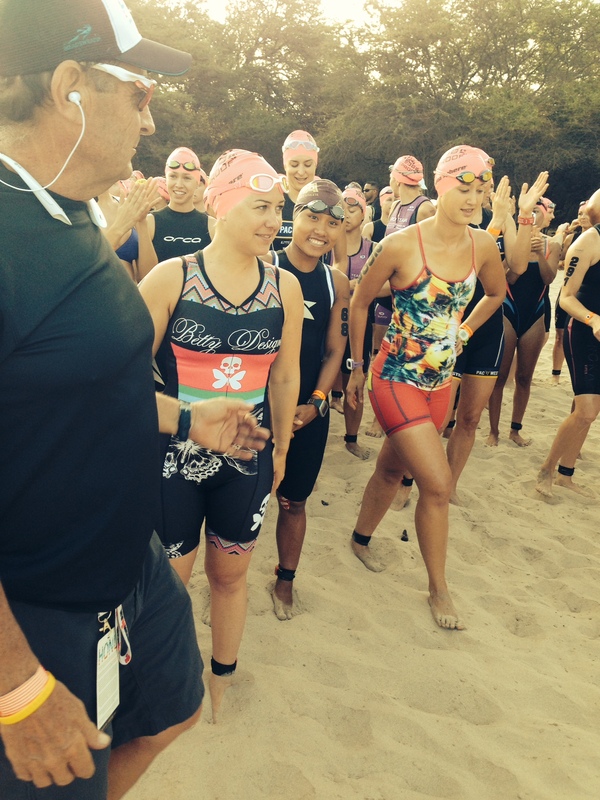 I did pass a number of women though in the process and came into T2 in 7th overall and 2nd in my AG. My focus this year has been to not let anyone pass me on the run so the worst I can do is finish in the same spot I was entering T2. Outside of Monica Torres passing me at Century Tuna Ironman in Subic earlier in the year I have not been passed on the run in a race this year….. In my AGE group anyway. Running has never been my favorite part of triathlon but I continue to work hard on form and conditioning and am seeing slow and steady improvements in this area. The run was sold as very flat by race director. It WASN’T lol. 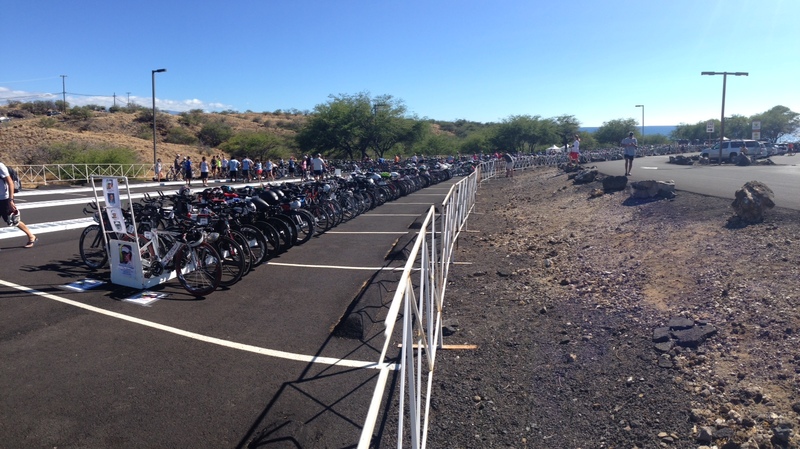 The whole race was rollers with half of it on the grass on the golf course and the other half on rollers out in the lava fields around the hotel. Temperatures got into the 90’s and people were walking and bonking left and right, but no women in my AG passed me. I did not catch the woman ahead of me so finished in 2nd place in AG and 7th overall AND punched my ticket to Austria for Ironman 70.3 World Championships! As always special thanks go out to all who follow and support me in my racing and in my life. It is so rewarding and encouraging to have so many well wishers throughout my racing and training. Also huge thank yous to all my sponsors. Vitargo which is the best fuel on in the world, iRT wheels the best wheel sponsor I could hope for, Quintana Roo who gets me onto very fast bikes, Rocklin Endurance Sports with bike builds and service all around, Death row velo for the numerous race kits to keep me in style and Xterra wetsuits that have given warmth in the cold and stylish skinsuits for the warm water.